Calico Baked Beans are awesome! 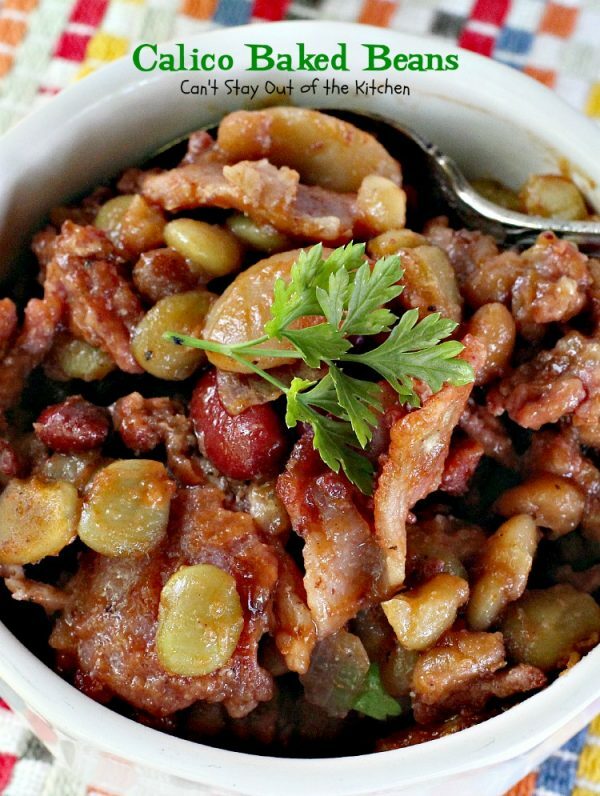 Lima Beans, Butter Beans, Kidney Beans and Pork and Beans are mixed together with ground beef or ground turkey, bacon, onion in a tasty homemade sauce and baked up to perfection. 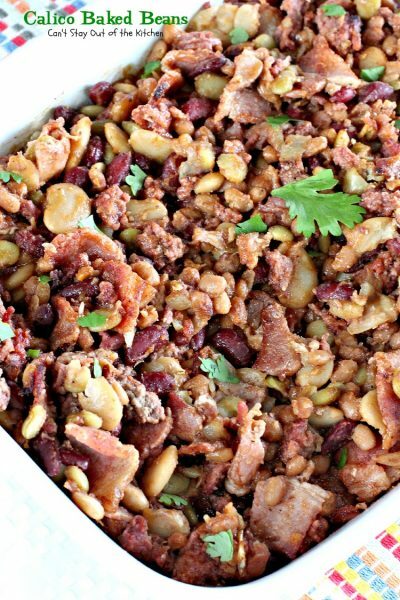 This casserole is a great dish to serve during the summer holiday season when you need a dish for a potluck, a backyard barbecue or grilling outside. We especially love to serve this dish with Barbecue Brisket, Creamy Potato Salad and my Famous Deviled Eggs. Talk about a terrific meal. This is it! I’ll never forget the kindness of Marge Currin when she brought us this casserole, a salad, and a delicious lemon pound cake on moving day when we moved to New England in the dead of winter, January 1990. She was the executive director’s wife and took the time to make us this delicious meal as we were unloading our U-Haul with snow on the ground and two young boys in tow. She is the one who inspired me to start taking meals to others when they are sick, giving birth, moving into a new house, bereavement, etc., because I remember how grateful we were to receive that meal. We were still unpacking and hauling furniture and boxes in from the truck, but we stopped and set up a card table in the kitchen and sat down to eat what was a delicious feast to us at the time. Marge is the one who gave me this recipe, but it is another one that is all over the Internet and in cookbooks in many different versions. I have no idea who actually created the recipe, but it has been around a long time. It works wonderfully in the crockpot too. 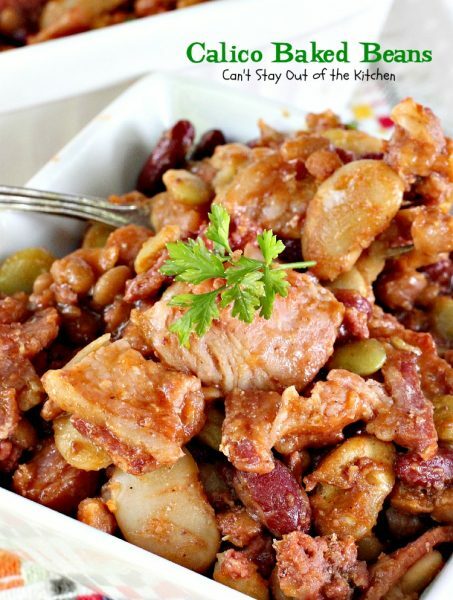 I have to admit that I love Baked Bean recipes. I also have Hearty Cowboy Baked Beans, Spicy Baked Beans and Coca Cola Baked Beans that isn’t as unhealthy as it sounds, and all taste fabulously. 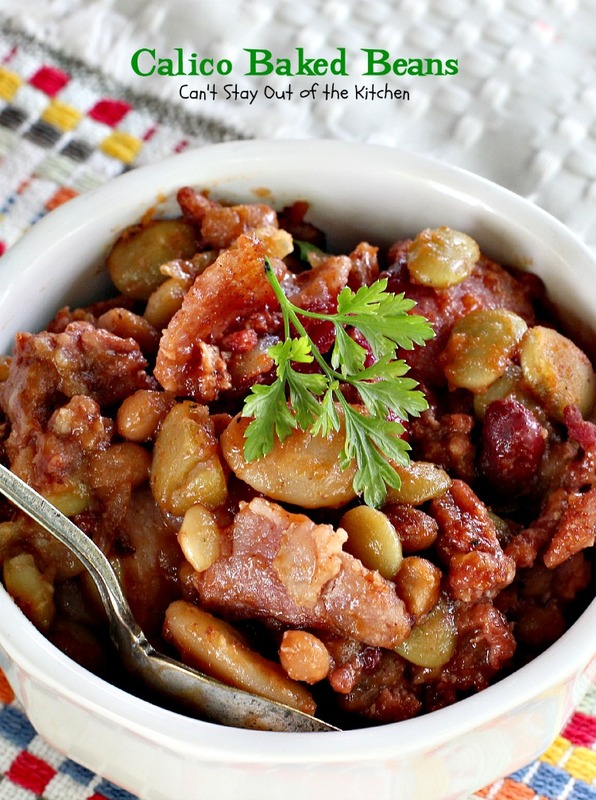 If you’re a connoisseur of good baked beans give one of these tasty recipes a try sometime. 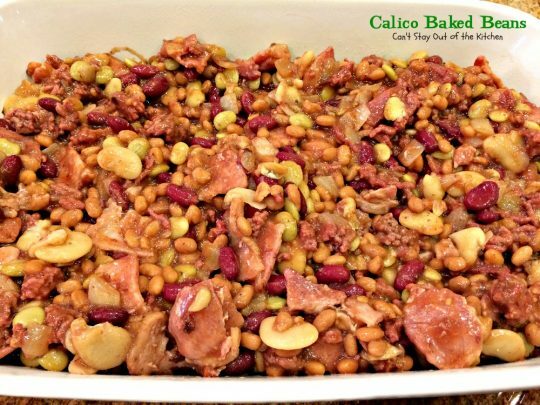 If you’re looking for a spiffed-up baked beans recipe, Calico Baked Beans has been one of my most requested recipes over the years. It’s truly delicious and not difficult to make either. This recipe is gluten free if your pork ‘n beans, bacon, and ketchup are gluten free. When I initially posted this recipe June 2012, I had only been blogging for a week. My little iPhone 3 was just not up to snuff when it came to taking quality pictures, but it was all I had to work with. I recently remade this recipe for a potluck for our Sunday school class (April 2015) and retook the pictures. Everyone commented on how much they loved my beans and several wanted to take the leftovers home! The original recipe called for one cup of white sugar and one cup of brown sugar which I’ve always found to be a little too sweet. I’ve eliminated the white sugar entirely and now use only about 1/2 to 2/3 cup brown sugar. Everyone found the beans to be flavored perfectly–not too sweet and not to vinegary. 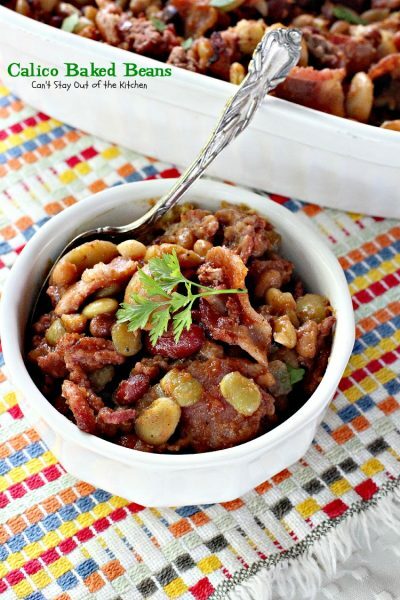 Calico Baked Beans has always been one of our most requested Baked Beans recipes. Every bite of Calico Baked Beans is amazing. 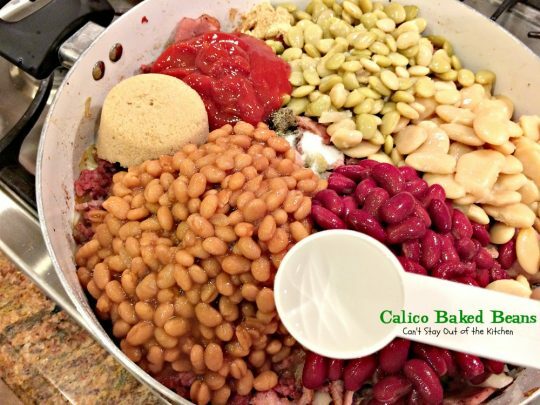 If you take Calico Baked Beans to a potluck, you won’t be bringing home ANY leftovers! Fry ground beef or turkey in skillet. Add bacon, cut in 1-inch pieces. Fry together in skillet. Dice up an onion and add to skillet. Brown until bacon is cooked through. Drain off grease. Add kidney beans, butter beans, lima beans and pork and beans. This recipe calls for a lot of sugar. I eliminated the white sugar entirely and used about 1/2 cup of brown sugar. Add sugar to skillet with ketchup, dry mustard, vinegar, salt and pepper. Stir to combine ingredients and pour into a greased 9×13″ glass baking dish. Bake about 45 minutes at 350. Calico Baked Beans is a great recipe to take to a backyard barbecue. 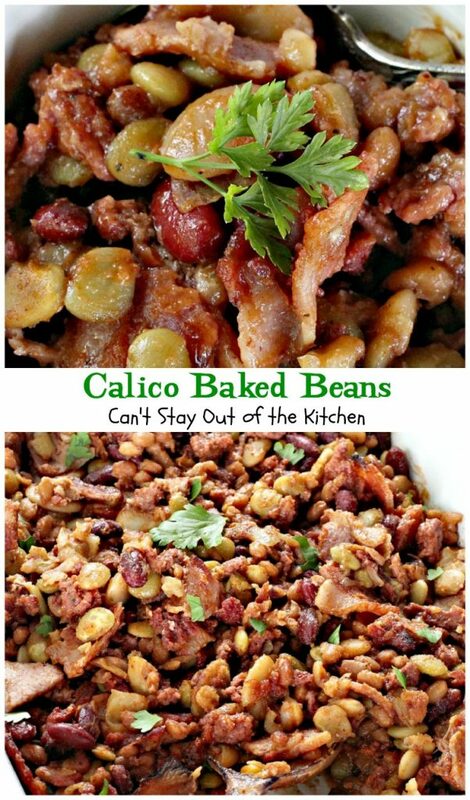 If you enjoy Baked Beans you’ll love Calico Baked Beans! 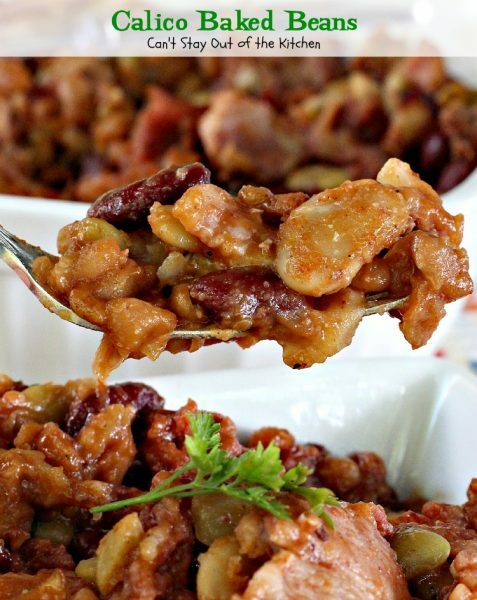 These delicious baked beans use several kinds of beans and are cooked up in a delicious sweet and savory sauce that's wonderful. Great for backyard barbecues and grilling out. This recipe is gluten free if your pork 'n beans are gluten free. 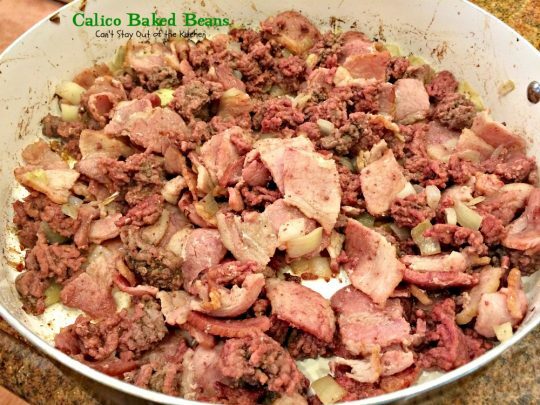 Brown beef and bacon in skillet, add onions and cook until softened. Add beans, sugar, vinegar, mustard, ketchup, and salt and pepper to taste. Bake 40-45 minutes at 350°. NOTE: I like to add a can of lima beans and one of any of the following: pinto, black, navy or cannelloni beans. 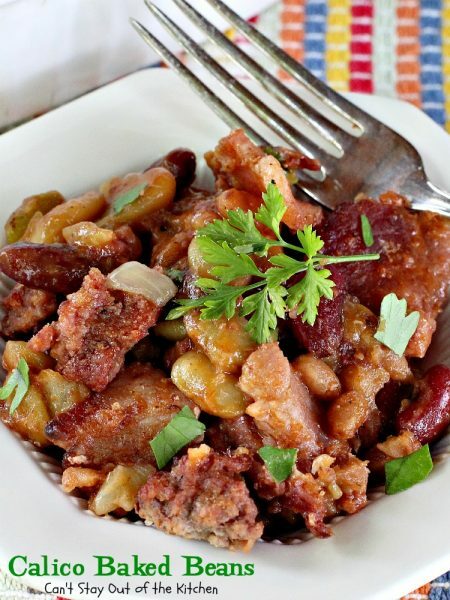 These delicious baked beans use several kinds of beans and are cooked up in a delicious sweet and savory sauce that’s wonderful. Great for backyard barbecues and grilling out. This recipe is gluten free if your pork ‘n beans are gluten free. I like to add a can of lima beans and one of any of the following: pinto, black, navy or cannelloni beans. 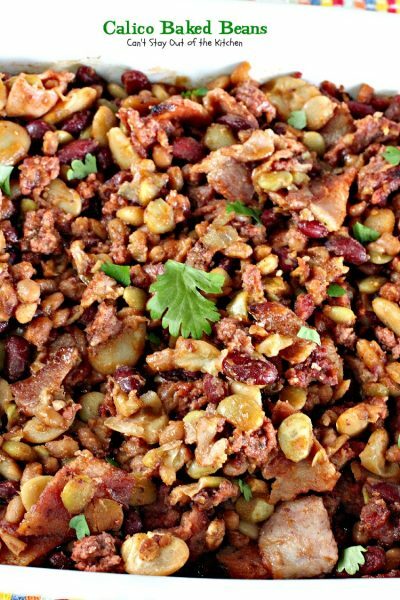 Consider taking a pot of Calico Baked Beans to your next potluck. 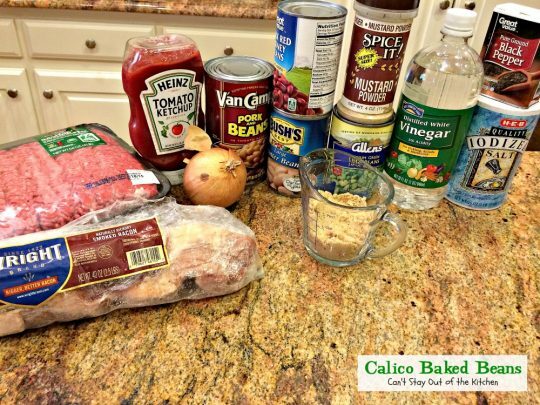 The savory and sweet flavors of Calico Baked Beans are perfectly blended.